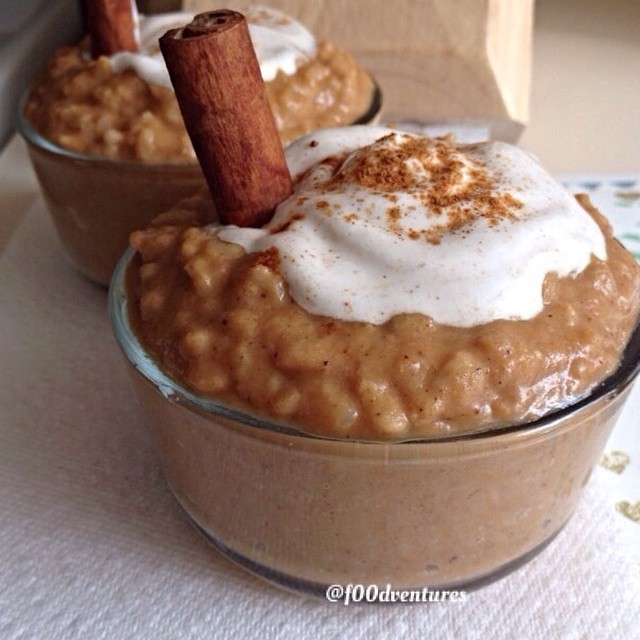 Here's a great twist on traditional fall dishes - pumpkin pie risotto! If you love pumpkin pie, then you will love this pumpkin pie flavored risotto! Relatively easy to make and bursting with pumpkin flavor! In a medium pot combine rice with your spices plus 1 cup each water and almond milk. Stir rice frequently for 10 minutes as it cooks and slowly add the rest of your liquids, except about 1/2 cup milk. Continue cooking the rice for another 20 minutes. Add te vanilla extract and egg and mix well. Mix in the pumpkin purÃ©e and the rest of your milk and mix well. Just before serving combine greek yogurt with cinnamon and add a dollop on top.